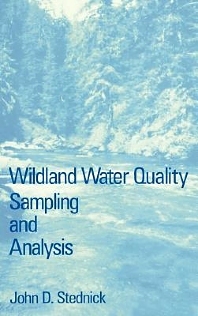 This comprehensive reference combines sampling and analysis of wildland water in one text. It includes sampling techniques for precipitation, surface water, and ground water. Analytical techniques for common water quality constituents are described. Both a reference for professional hydrologists and a main text for upper-level undergraduate and graduate students studying (wildland) water quality and land use. Chemistry Review. Sampling Procedures. Water Quality Sampling Program Design. pH. Conductivity. Water Quality Sampling Field Methods. Gravimetric Analysis--Solids Determination. Turbidity. Spectrophotometer and Beer's Law. Phosphorus. Nitrogen. Alkalinity. Hardness. Chloride. Sulfate. Dissolved Oxygen. Biological Oxygen Demand. Enteric Bacteria Analysis. Contract Laboratory Selection. Data Analysis and Presentation. Index.